“Converting Connections to Ca$h & Relationships to Revenue"
CUPERTINO, CA (PR Buzz) – October 11, 2018 – – Connections begin when there's conversation. With the technology we have now, it's easy to connect with people in so many ways. It could also be a distraction, especially if you want to have real and genuine connections. Because everything is connected, believe that there's always a person on the other side who is willing to listen and share their precious time. Your sphere of influence also grows when you expand your network through personal communication. Go out of your comfort zone and step forward with Rhonda Sher's new AHAbook, "Converting Connections to Ca$h & Relationships to Revenue." 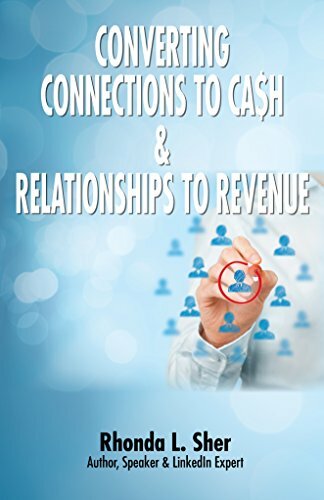 This book outlines ways to convert quality connections to cash and relationships to revenue. If you are a professional looking to learn more about how to reach out, engage, and build lasting relationships, then this book is perfect for you. “Opportunity is limitless. The universe has so much to offer, and random acts of kindness can go a long way. Quality connection is what makes us a person and undeniably builds business success,” says Mitchell Levy @happyabout, The AHA Guy Thought Leader at AHAthat™ (http://AHAthat.com). Read and share amazing AHAmessages™ from " Converting Connections to Ca$h & Relationships to Revenue " by going to http://aha.pub/ConvertingConnections.